The city of Maricopa spans approximately 43 square miles with a population of nearly 50,000 people. Transportation options in the city and surrounding areas include planes, trains and automobiles. 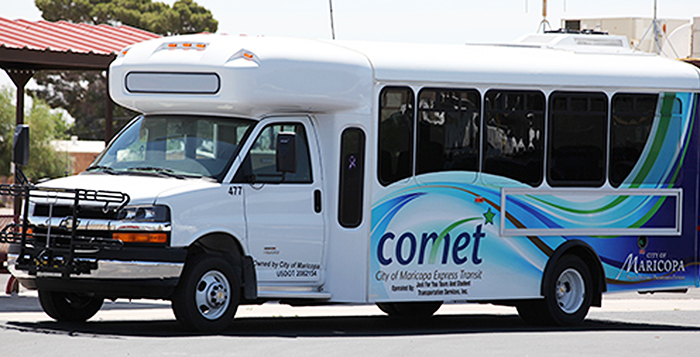 City of Maricopa Express Transit (COMET) is a van and shuttle service offering fixed stops throughout the city. All COMET vehicles are ADA compliant. COMET also offers a reservation service providing transportation anywhere within city limits. Reservations must be made – and canceled – with at least 24 hours’ notice. COMET provides a reservation-based service to hospitals in Chandler and Casa Grande. Reservations and cancelations must be made 24 hours in advance. A carpool service offered by Valley Metro operates within the city of Maricopa to those who commute at least 30 miles from work with a 45-minute or longer drive. Vanpool riders are responsible for organizing their carpool with Valley Metro and determining where to park and meet. Vanpool users must seek permission from businesses when using private parking lots to park-and-ride. For those with long-distance travel needs, Maricopa has an Amtrak train station located at 19427 N. John Wayne Parkway. The station has an enclosed waiting area and parking lot south of the Zephyr train car. Amtrak operates a Thruway bus connecting the Maricopa station to stops in Phoenix and Tempe. Although there is no commercial airfield in Maricopa, Ak-Chin Regional Airport accommodates personal and business transportation, flight training and recreational aircraft operations.